This combination of tonic herbs can be taken for tiredness and lack of energy and will energise the body by cleansing the blood, soothing the digestion and stimulating the kidneys. This is a unique blend of herbs with anti-inflammatory and blood cleansing properties. This Eczema Tea blend also supports the liver while it eliminates toxins from the system, and contains herbs that reduce stress within the system. This is a combination of herbs that will aid people suffering from diabetes. These beneficial tonic herbs will improve the body's resistance to infection. The Immune Boosting Tea will energize the body by cleansing the blood, stimulating the kidneys and will also soothe the nerves. This combination of herbs provide relief to sufferers of Kidney and Bladder complaints, promoting better Kidney and Bladder function, and relieves backache due to these problems. The Slimming Tea is a blend of herbs that will assist the process of slimming. It contains cleansing or detoxifying herbs and diuretic herbs to reduce water retention, as well as herbs that stimulate the digestive system and the body in general. The Ulcer Relief Tea is a combination of herbs that will bring relief to the symptoms of stomach ulcers. 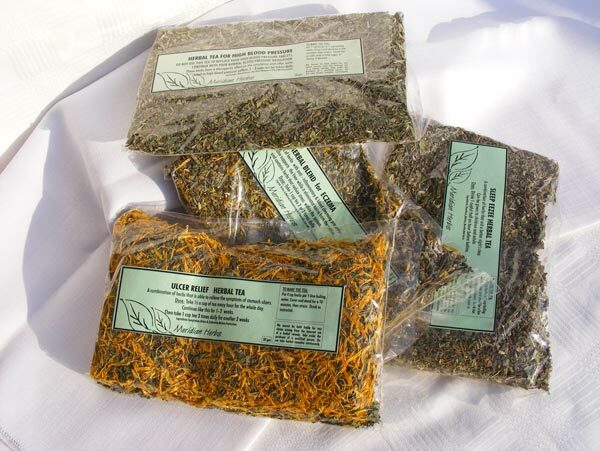 This is a blend of herbs that can relieve the symptoms of colds and flu'. The Colds and Flu' Tea Blend will assist in reducing fevers and congestion associated with colds. This herbal tea blend for woman can be taken to lessen symptoms of menopause. These symptoms include hot flushes, sleeplessness, irritability and anxiety. A combination of herbs that support the overburdened liver assisting the process of decongestion. For the Relief of painful piles (heamorrhoids). Should be taken in combination with the "Piles Relief" cream and the "Piles Relief" herb drops. Assists to relieve stress, nervousness, anxiety, tension, worry and irritability. Take in combination with the "Stress Relief" herbal tincture and the "Good Night" Sleep Tincture. For the Relief of stress, tension, anxiety and nervousness.